Which Linux Distro for new users? People ask how to get started with Linux all the time. But they need to know what the best distribution is for learning? Or for beginner users? Or to install on a spare laptop as newbies trying something different out. So I made a video. The script I used while recording the narration is below. Posted in From the Help DeskLeave a Comment on Which Linux Distro for new users? A possible solution for security conscious travelers? Posted in From the Help DeskLeave a Comment on A possible solution for security conscious travelers? This is a simple fix I discovered while working on a larger, more complex problem, when my entire computer was stuck “checking for updates.” Below only applies to fixing the issue with stand alone installers. If you need to fix the entire Windows Update / Microsoft Update feature of your computer, see my other article here. If the installer is currently stuck open on your screen, you can open task manager and kill it by ending the task WUSA.exe. Hold down the Windows Key and Press “R” on your keyboard to open the “Run” dialogue box. Type in services.msc and press the enter key or click OK.
Scroll toward the bottom of the list and find the Windows Update service. Right click on it, and click Stop. Go to the folder where you downloaded standalone installer and double click it to run it. You may notice, at this point, that the Windows Update service starts back up. People may use Task Manager to note that SVCHost suddenly starts using over a gigabyte worth of memory, or other strange behaviors. However, in the few seconds before it starts to behave rampantly, your stand-alone installer should have taken off and started to install your update. The “checking this computer for updates” screen should disappear in under 10 seconds and the installation should begin. I recently ran in to an issue I’ve seen at least a dozen times before. This time, however, absolutely nothing I have tried before would fix it. I will save the exposition for the bottom of the post, the short version: Microsoft’s official fixes wouldn’t even work because the standalone installers had the same problem as Windows Update, and every other guide, manual fix, and 3rd party tool I attempted to use failed! If you didn’t build a recovery image before you had problems with your Microsoft Surface device, good news! Microsoft will allow you to enter your serial number and download a recovery image! Instructions and downloads are available directly from Microsoft! The quick work around I’ve found is to simply put the laptop in Airplane mode, and then immediately take it out of Airplane mode. This will allow the laptop to connect to your wireless network. I can’t believe I never put this article on my site before, it’s an ancient tip, and still useful for the “average” home user. Do you have a home computer and you don’t want to be pestered for a password every time it starts up? The following steps should be all you need Enjoy! Open the Run Menu (Either by clicking Start then Run – or – simply be holding Windows Logo Key and pressing R on your keyboard). 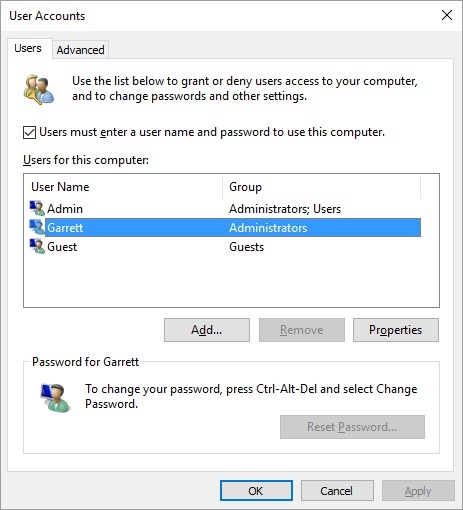 Type: control userpasswords2 (leave the 2 off for older versions of Windows like XP and 2000) and hit enter or click OK.
Click OK then enter your password (twice, to confirm you typed it correctly) – if you do not normally enter a password, just click “OK” leaving the two password lines blank – then click OK. I believe the prompt may disappear even if you typed the incorrect password, so the only way to be sure it worked is to restart your computer. If all went well, the next time you start up, you should not be prompted for a password and be logged directly in to your desktop! Try it out! If you see the user logon screen or are asked for a password, you probably just missed the password in step 5. Pay close attention to what you type (or don’t type) at the logon screen, then try it again. Proudly powered by WordPress	| Theme: ioboot by ioTheme.